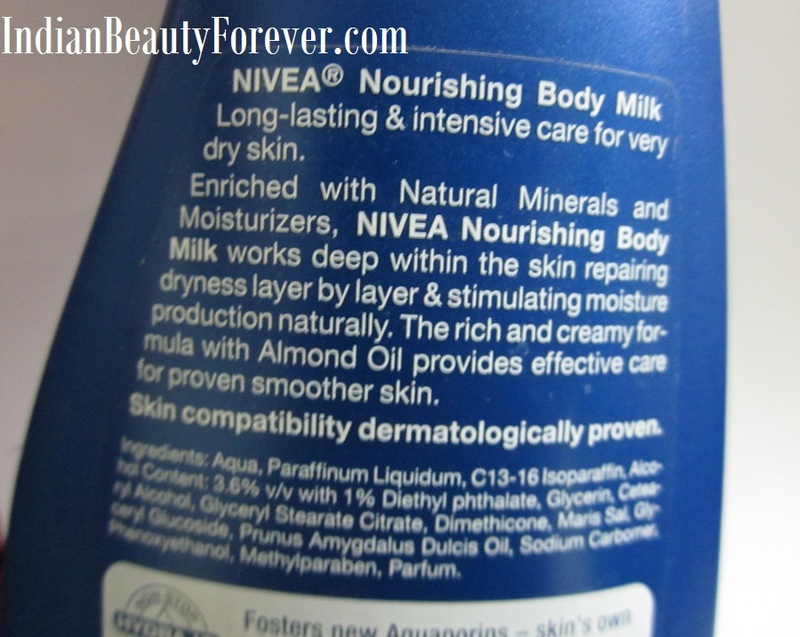 I will review Nivea Body Milk which is meant for very dry skin. In winters skin gets dry and those of you who already have dry skin needs something that can nourish and hydrate the skin well and keep the skin moisturized for a longer time. This Body milk is priced at 269 rupees for 400 ml which is the biggest pack it is also available in smaller sizes. Experience- Just like most of the other body lotions this Nivea body milk also comes in a big flip top cap pack which you can easily carry while traveling. The body milk is very thick creamy and milky formula that smells mild and pleasant. I like the fact that it doesn’t have very strong smell, just a mild one that lingers on for a an hours once you have used this. It takes some time to get absorbed into the skin and once it does, I instantly feel that my skin looks dewy, glowy and well moisturized. I like to apply my body lotion as soon as I come out of the shower since at that time your skin is damp and it can be absorbed well. Damp skin is best to use any type of lotion, creams and moisturizer. It keeps my body skin moisturized for good 6 hours and it also depends weather you are at home or outside or what type of body skin you have. I mean you have have too dry skin then it may work for 5 hours approximately after which you need to reapply this body lotion to combat dryness. It consists of almond oil which you may be knowing is known to keep the skin hydrated especially for dry skin. 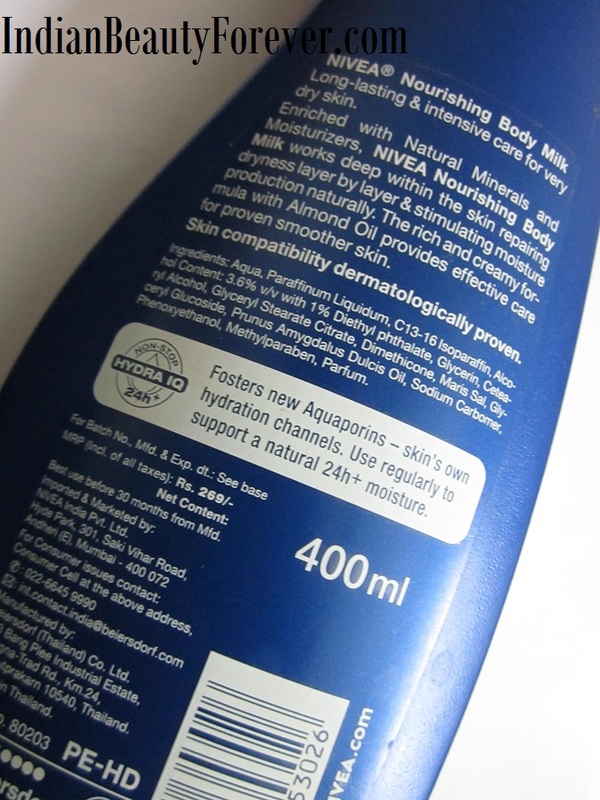 While going through this body lotion I have seen it contains parabens and by now most of you may know that parabens are used as preservatives that enhance the shelf life of a product. This is the main reason why these cannot be avoided by most of the cosmetics and beauty care companies. My mum has very dry skin and my cousin as well and they both like this product. If you have very dry skin you can try this body lotion it really helps getting rid of the dryness and I will also recommend. Parachute body lotion for dry skin as well. These two work very well. Except for the parabens I do not have any complaints with this lotion. Even parabens can’t be really a con since most of the products have it. 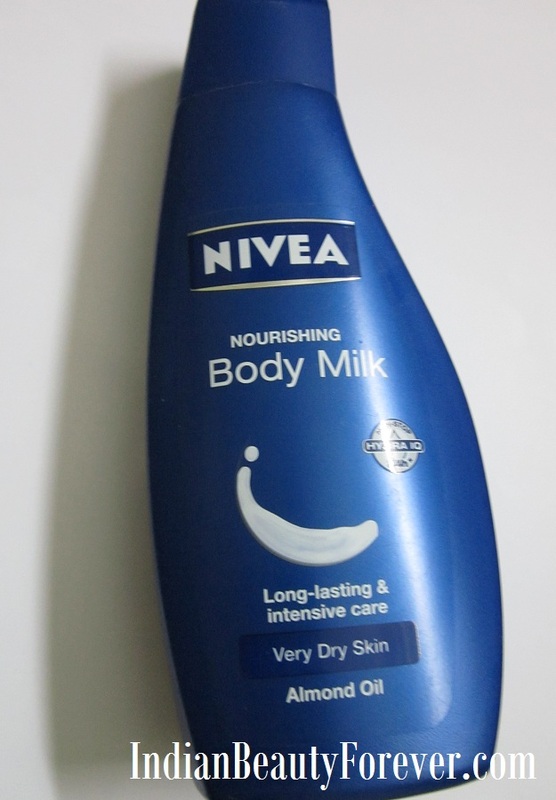 Take- Nivea body milk for dry skin is pleasant smelling lotion which comes in a decent quantity for the price that makes it a budget friendly and effective product. It is a good option for people with dry skin. 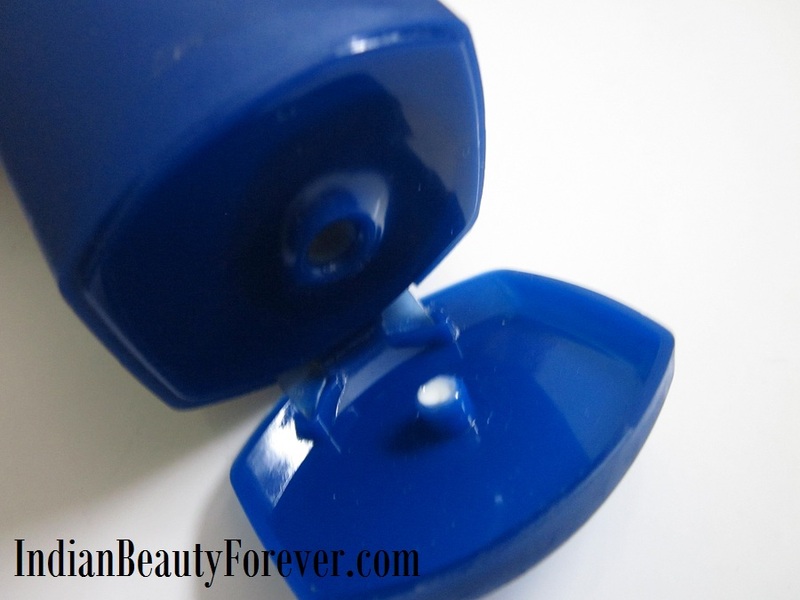 It moisturized and hydrates the skin instantly and keeps moist for a longer time. I buy this one sometimes I quite like it. this sounds really nice.... this will work great for my legs!!! !